CMI Print Stations will produce the brilliant colors and consistently uniform printing your customers demand. Custom designed to fit in-line with your current finishing line, CMI Add-on Print Stations give you the advantage of additional quality color printing. 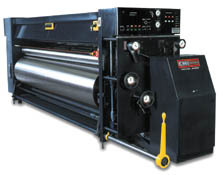 Machine sizes range from 24" x 66" to 86" x 212". These heavy duty machines easily withstand the twenty four hour everyday demands of a corrugated box plant. The CMI High-ro-graphicsTM Enclosed Dual Doctor Blade System features a balanced pressure, pneumatic blade system that evenly and accurately distributes the ink with virtually no ink leakage. Color tones benefit from the exceptionally consistent ink viscosity and the enclosed system eliminates most airborne contaminates. The swing back blade holder is easy to use and allows for fast blade changes. Our Fully Automatic Washup System and upgrade to a Digitally Controlled Running Register are available as options. Why think about a new flexo when you can buy add-on color for substantially less money! Upgrade your existing equipment with a CMI Add-on Print Station. The High-ro-graphics Enclosed, Reverse Angle Doctor Blade System. Mechanically engraved ceramic coated anilox roll with your choice of screen up to 200 lines per inch. Manual washup and CMI Ink Pump System. Plate cylinder with Mathews system slot and two auxiliary slots in the positions of your choice, laterally adjustable. 360° running register compensator (electric). Digital register is optional. Pull roll assembly. Vacuum transfer is optional.